In a previous post I’d shown a way to get the Lyapunov exponent from the time series data of any map. 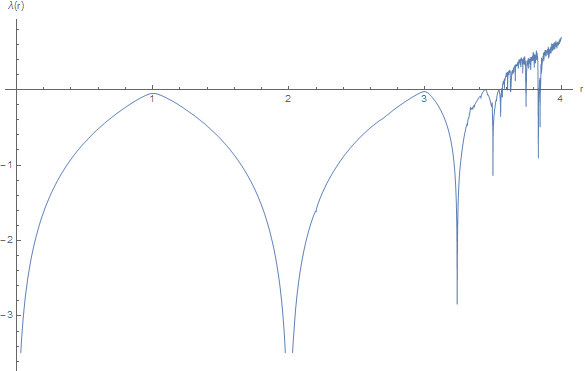 In this quick tutorial, I’ll show you a cleaner way to get the Lyapunov exponent for the specific case of the logistic map, and then using a really short script in Mathematica, plot it against r.
First the mathematical analysis that simplifies the expression for the Lyapunov exponent for a map, and particularly the logistic map. This discussion follows this article. For the logistic map, . In the line that uses Nestlist, we specify the starting point of the trajectories. However, I noticed that the output does not depend on the starting point.